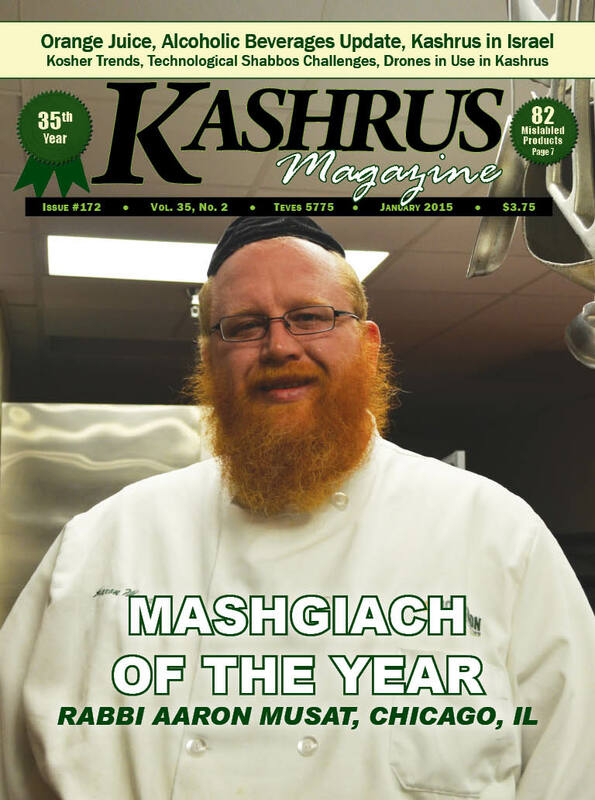 The “Mashgiach of the Year” is chosen by the staff at KASHRUS Magazine through phone interviews with candidates who are nominated by any of the 1,269 kashrus agencies. We look for an outstanding mashgiach, someone who commands respect from the kashrus agency he works for and someone who exemplifies what a good mashgiach is: knowledgeable, committed, unswerving, loyal, and a hard worker. There are many other mashgichim who are worthy of awards for their efforts, but our man has to be good, really good. Maybe in years to come some of the other nominees will be chosen as “Mashgiach of the Year,” but this year, this mashgiach has been deemed the most exceptional. Obviously, the term “Mashgiach of the Year” does not mean that this particular year was our awardee’s best year ever, but it is the year that we discovered how good he is at what he does. We are very strict with our criteria for who can be nominated for this prestigious award. 1. First and foremost the man who receives the title of “Mashgiach of the Year” and the $1,000 cash award that accompanies it must be a mashgiach, not a supervisor with has mashgichim working for him, nor a rabbinic coordinator, a rabbinic field representative, or a rav hamachshir. We need a top flight mashgiach who has not left his post “on the ground” to become a kashrus supervisor for the agency. 2. He has to be good, very good. We invite each kashrus agency to nominate either one or two of their mashgichim to be interviewed by our committee. That means that their recommended mashgiach has been selected from what may be hundreds of other mashgichim who work for the kashrus agency. Being a mashgiach is a very demanding job. He does not get top pay, and, is, what we like to call, the “unsung hero of kosher.” We are proud that each year we can give one mashgiach the title of “Mashgiach of the Year” and a $1,000 award. This year’s winner, Rabbi Aaron Musat, works as the sole “cRc” mashgiach for the Lieberman Center for Health and Rehabilitation, a senior living facility in Skokie IL, which houses approximately 230 residents and serves 1,000 meals daily. His day can begin as early as 5:00 AM and has, when needed, extended a full 18 hours. But his claim to fame is his winning personality, an absolute necessity for the successful mashgiach. Rabbi Musat received his award at the Kosherfest in New Jersey’s Meadowlands Exhibition Center. A large crowd attended the ceremony when we presented Rabbi Musat with the $1,000 check and proclaimed him as “Mashgiach of the Year.” We hope that this contest helps mashgichim everywhere to gain widespread appreciation. Rabbi Aaron Musat was born and bred in Australia. He came to the U.S. some twenty years ago to learn in yeshiva. Starting part time in kashrus, Rabbi Musat worked in Pesach hotels and for several restaurants before moving to Chicago twelve years ago to work for the “cRc.” For the last nine years he has served as the mashgiach of the Lieberman Center for Health and Rehabilitation in Skokie, IL. Rabbi Musat appeared on Kashrus On The Air, KASHRUS Magazine’s weekly radio show over JRootRadio.com. What follows is based upon that interview. RABBI WIKLER: Rabbi Musat, what do you see as the #1 function the mashgiach must focus on at his facilty? RABBI MUSAT: Communication. Good communication is the best way to preserve kashrus. I maintain an open door policy. My staff - some 35 people - feel free to come to me with a kosher challenge. “Rabbi, a family on the fifth floor is trying to bring outside food into the room. Please come and speak to them about kosher.” “Rabbi, I’m sorry. I made a mistake and took a meat ladle for dishing out the food at breakfast.” Without proper communication I could not be successful in maintaining kashrus here. The staff knows that I won’t “write them up” for an infraction because they came to me. So my hand can reach even further than my eyes can see. Communication begins with “Good morning” and continues with relationship building throughout the day, every day. I try to maintain an even-keeled demeanor so that the staff will feel comfortable to come to me. It’s working very well, but a mashgiach still needs to be always vigilant. RABBI WIKLER: You talk about “my staff” as though they are working for you. As I understand you are the mashgiach, not a staff supervisor. RABBI MUSAT: Yes and no. I am the mashgiach for the “cRc”, but, I learned early on that to be effective as a mashgiach I should take on additional responsibility, not because I was told to nor even asked to, but because it is good for kosher. I decided to accept upon myself duties that relate to my work as mashgiach. So, I do all the ordering of the food. This way I know what comes in. I even pay the invoices. This way I have the paper trail in front of me. Nothing comes into the facility from any vendor that I don’t know about. I also do the scheduling for the workers. This way I have the right person in each place so that I am confident that the jobs are being done with very few kosher challenges cropping up. That’s why I call them “my staff”. The director of dining services, my supervisor, considers me a supervisor and that is also very good for kosher. My job also calls upon me to do staff training and I take that very seriously. I don’t have a hard time of it though because the staff is treated very well at our facility and turnover is very light indeed. There are many workers in my staff who are there 10, 15, 20 and even 30 years. But, sometimes we do hire. When a new worker comes, I first give them an overview of kosher. They usually never heard of kosher growing up; maybe they never even saw a Jew. But, I don’t stop there; education per se is ineffective for kosher training. I have the new employees shadow the older ones, those with the most experience. They do nothing but watch, no hands on. This goes on for 2, 3 or even 4 weeks in various departments throughout the facility. Then, the experienced employee steps back and watches the new employee, observing how he performs. I deal with his questions. It’s very effective. RABBI WIKLER: Despite all your work, kosher errors can occur. What do you do to keep the error rate down? RABBI MUSAT: Kosher errors occur for two reasons: improperly labeled equipment and necessary equipment missing. Let’s face it, if a utensil, plate or pan lacks clearly visible identification as meat or dairy - we don’t do pareve - the worker can mess up. We are very careful about that. We put holes in all corners of a pan. We use blue tape to identify dairy. We have different patterns for dairy and meat utensils — one is plain with no design, while the other has a fancy design. It’s very clear. We do dairy for breakfast and lunch and do not serve supper until all our dairy dishes have been returned to the kitchen. I also use clear signage — no outside food is allowed. My staff will alert me to any violation and I will do kosher education with the violator. Pretty much everyone is cooperative. One trouble area is rehab. Our regular long-term residents are used to our system and do not try to bring in non-kosher foods, but the rehab residents are short-term and they may try to do that. We go into the rooms and educate the family - tell them the parameters of kosher. If they insist on bringing in their own food, we will give the resident his food from the kitchen on disposable plates and with disposable utensils. The other problem is with the workers themselves. There is no incentive to cheat on kosher, but that is only as long as there is enough equipment ready for the waiters and ingredients available for the chefs. If you have what everyone needs, you provide them with the tools to do their job and you put the staff in the right position, you seriously limit kosher challenges. The fact that I do the ordering means that there is never a lack of ingredients or other things that we need. I am always several days ahead in my ordering and I make certain that we have enough of everything. RABBI WIKLER: I have heard that you have been called upon to use your expertise in kosher to help the company that you work for to set up similar programs in other facilities. Can you tell us about that. RABBI MUSAT: So far there are two facilities where I have helped out: one in Columbus, Ohio and one in Rockville, Maryland. The company that I work for was making a bid to take over the food service for the facility in Rockville, Maryland and called me in to join the team. I was their kashrus expert and had to examine everything from the kashrus perspective: what was needed and how costly. They needed to be sure of their costs and whether they could do it properly. That facility is huge. It has 1,100 beds in five building. There are only two, sometimes three, mashgichim and they do a lot of walking each day. Once they got the contract, I did a good deal of training for several weeks for the staff: chefs, dietitians, etc. I worked together with the Vaad of Washington on the project. Aside from the size of the facility they are quite different in that they have the added challenge of having such diversity among the residents: skilled nursing, independent living, subsidized living, etc. The plethora of the scope of services brings with it special challenges such as new admissions on Shabbos and the fact that not all residents are entitled to the special leniencies for the sick on Shabbos. RABBI WIKLER: What is your day like at the Lieberman Center? RABBI MUSAT: My day starts by lighting the fires at 5:00 AM. I set up the workers for breakfast and then at 6:00 I am off to take care of my own family’s needs. Then I return and stay till after dinner is served. My day is filled with activity. Aside from the ordering and bill-paying activities I told you about earlier, I do vegetable inspection, and I am traveling to all the floors. We have the kitchen and five work stations - points of service - one on each floor. I’m on the go the entire day. RABBI WIKLER: I’ve heard that you also try to meet special needs of residents. How so? RABBI MUSAT: I believe that every resident at the Center is entitled to eat three nutritious meals a day and feel confident that their standard of kosher is being observed. In practice it takes some doing. Our facility is not cholov yisroel, nor is it yoshon-only. It is glatt kosher but there are people who limit themselves to a particular shechita. I make it my business to order what they need or to shop for the items myself. In some cases I buy a few items and keep them in the kitchen, but if it is a daily item like yogurt, I will pick up a week’s supply and put it directly in the resident’s own refrigerator. That is the most efficient way. RABBI WIKLER: Everyone has challenges on their job, things that they don’t want to do. What are yours? RABBI MUSAT: Obviously, starting out at 5:00 AM has to be one of them. My biggest challenges are the need to stay on top of the new programs. In today’s world, providing care for seniors is constantly evolving. New programs and new equipment are always being discussed. Some of them are serious challenges for kosher. I have to spend a good bit of time researching them, deciding what we can use, and adjusting everything to a kosher diet. And Shabbos also comes into play. Some of the new kitchen equipment is top notch but present kosher problems with bishul yisroel. Convection oven and the turbos would require a mashgiach constantly by the side of the cook. There is no pilot light. Each time the oven is opened and the food prepped, the mashgiach must close the oven or else the food becomes bishul akum, plain and simple. So I am especially excited about our new pureeing program. Seniors who have difficulty chewing or swallowing sometimes require a diet of soft food. Many assisted living communities are able to accommodate this need and provide pureed food to residents when required. But we go the extra mile to present pureed food so that it’s beautiful, palatable and dignified, a Kiddush Hashem. To see the full 9 page article, including pictures and sponsors, send an email to kashrus@aol.com with "Mashgiach Article" in the subject line. It’s a pivotal rite of passage, that first year away from home. That’s how a large percentage of eighteen through twenty-something year olds find themselves aboard that plane en route to the Holyland. The boys will be heading to yeshivos and year-long programs in the Mir, Brisk, Kerem b’Yavneh, and Bais Yisrael, to name just a few. The girls are headed to exciting programs in Meohr, Bnos Chava, Michlala, Pninim, BJJ, and countless others. For some, it will be their first time stepping onto the holy soil of the land of our forefathers, while other seasoned travelers will already know their way around the crowded airport. After inhaling that first lungful of fresh air and taking in the site of the towering palm trees lining the highway, each student will be on his or her way towards a year of growth, change, and inspiration. Each school has its own methods on how to impart integral messages into their student body, with their own personal array of rabbanim, teachers, madrichim/madrichot, tiyulim, shabbatons, and more. But there are some things that are no school in particular’s, yet everybody’s together, such as the Kotel, Kever Rochel, Meiron on Lag B’Omer, Shaar Shechem on Shavuos night, and various activities of chesed, to name a few. Each school will have its own dress code, its own set of rules, and its own level of standards in almost everything. One main point of substance is hechsherim. Coming from countries where the word ‘kosher’ on a label basically means it’s okay to eat, it’s hard to be thrust into a world of tens of different hechsherim belonging to different institutions, rabbanim, standards, and sects. The students are at most, completely unprepared. Their knowledge of Israeli kashrus will range from “I thought McDonald’s was kosher here?” to “Well, my father doesn’t eat Landau’s, but my grandfather eats it, but my father said only to eat Badatz…” The administrations of the various schools try to keep it simple, uncomplicated, and unbiased, while aiming to guide their students’ to keep high standards. A menahel at one of the many Bais Yaakov seminaries said, “Basically we tell them (to eat) whatever is pretty much accepted by all – Badatz, Shearis Yisroel, Rabbi Rubin, and Rabbi Landau. The same is for eating out. But, if a visitor wants to take them to a different hechshered restaurant, they should ask a shaila...” At Michlala Seminary, located in the beautiful neighborhood of Bayit V’Gan in Yerushalayim, they tell the students to “go Mehadrin,” referring to Rabbunut Mehadrin Jerusalem. “It’s basically, eat something Mehadrin or higher,” one student related. Clarified, it seems that the Michlala girls are encouraged to look for a Rabbanut Mehadrin sign on any eatery they enter, be it dairy or meat. If the restaurant or food court will have a Rav Rubin or Badatz Eida Chareidis certification, that’s even better. “It’s clear cut and uncomplicated… nobody ends up confused,” another student added. Meohr Seminary, located in Beit HaKerem (run by Rav Zecharya Greenwald, shlita, a renowned chinuch expert, and posek Rav Dovid Ostroff, shlita), lays out a few basic pointers for their students upon arrival. The administration explains, “We point out that kashrus organizations are comprised of people, and as such, are susceptible to mistakes, carelessness and ignorance. “To supervise enterprises such as factories and restaurants, the kashrus body must have the halachic knowledge and technological understanding of whom and what they are supervising, and when either (of those points) are lacking, the kashrus quality is compromised. Even when the above is of a high level, if the mashgichim or supervisors in the field are not serious people and take their job lightly, meaning that they cannot stand up to the owner of the restaurant, then the kashrus level is compromised. “Another important issue which requires understanding is the difference between a regular hechsher (ragil) and a mehadrin one. This is not to say that everyone who declares his kashrus to be mehadrin is indeed so. To the provider of the hechsher, the standards of one rabbi may be acceptable, when they are not deemed so by other rabbanim, who might think him to be too lenient or unqualified. “A regular kashrus is obligated to provide a hechsher to whoever asks for one, and if certain requirements are met, then he will recieve a hechsher. The regular hechsher, not mehadrin, must accept other supervisions and cannot say they’re not acceptable. A mehadrin hechsher can lay down its own rules and thus raise the standard to whatever level he wishes. “Consequently, we recommend only buying products that have, to our knowledge, proper halachic guidance, superior technological know-how and excellent supervision. The girls are encouraged to call the seminary’s rabbanim for any questions, any time, so as not to have to judge for themselves when questions arise”. Most seminaries seem to follow this approach, though some more intense ones, such as BJJ, actually give their girls an extensive shiur on the topic. “We walked out really understanding the ins and outs of the Israeli hechsherim”, one alumnus said. On the other side of the mechitza, in yeshivas Aderes HaTorah, the administration prefers to take a more ‘vague’ approach. “Whatever our own personal positions are”, one administration member said, “We don’t feel right pushing them on the boys. We tell them to remember that not everything that says kosher is in fact, so, and if they want further advice, they are welcome to come ask individual questions on the matter.” The administration said they also make a point of reminding the boys that anyone can put the word “Badatz” on their wall. That does not, by any means, automatically translate to Badatz of the Eida Hachareidis, which is one of the strictest hechsherim of Eretz Yisrael. The Mir Yeshiva maintains a similar position. There is no ‘sit down and take notes’ orientation. Instead the boys are welcomed warmly by the rosh hayeshiva and the rebbeim, and then told that if they have any questions, in any field, but especially in hechsherim, they should ask. One great rebbe and posek whom is often sought out for advice is Rav Nissim Kaplan, shlita. One Mir kollel man relates that when approached by students who are confused about Israeli hechsherim, Rav Nissim replies that there is no uniform answer. He looks at each boy and tries to gauge where the boy is coming from, where he is right now, and where he will end up. Rav Kaplan will then give him an answer that is suitable for him, and him alone. He also reminds the boys that the Mir generously supplies three square meals a day, Yom Tovim, Shabbosim, Melave Malka, and before and after fast days included, all made using only strictly kosher ingredients. Also, if a boy has a hard time finding Shabbos meals outside the yeshiva where he knows the hosts hold the same level of kashrus that he does, the Mir makes sure to take the boys out on beautiful Shabbosim away from Yeshiva a few times a year, where once again, all the food will be made from only the highest level hechsherim. The rebbeim stress that they are aware how complicated kashrus can be here, especially when combined with hilchos terumos and maaseros, and now shmita. Despite these “complications,” every new year brings with it a fresh wave of students of both genders. Knowing they are embarking into new territory, in a new country, in a new continent, these young people persevere against the unknown. After all, they have the secure knowledge that a year in Eretz Yisrael is worth every ounce of difficulty that it will cost. Where do I go from here? In the yeshivos and seminaries or somewhere along the grapevine you will find a list of recommended rabbis to call for kashrus information and other halachic issues. Here are a few of those rabbis: Harav Dovid Ostroff, Har Nof - 9722-651-9207; Harav Yehudah Baum - 97252-711-4118; Harav Yonason Weiner, Motz Badatz Sheiris Yisrael - 9722-586-3631; and Harav Nachum Eisenstein, Maalot Dafna - 9722-581-8338.